The design philosophy behind RESOTECH's Phase-Locked Dielectric Resonator Oscillators (PLDROs) is to provide its customers with a line of compact, lightweight, and low-cost units which offer state-of-the-art phase noise performance and the lowest power consumption available in the industry. 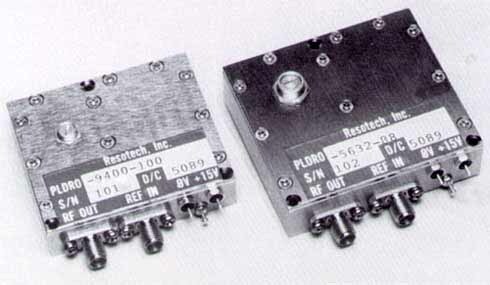 These units operate at frequencies from 4.0 to 14 GHz over the full -54 to +85 C temperature range and offer reverse polarity protection. These outstanding features are the result of incorporating RESOTECH's superior electrically tuned fundamental frequency DRO together with extremely efficient phase-lock circuitry into a single housing. Internal drop-in Isolator at the DRO output provides low pulling and low power consumption. The resultant high stability obtained by phase-locking a crystal reference to the fundamental microwave oscillator makes these units ideally suited for communication system applications and other high performance uses. Phase noise levels at offsets up to 100 kHz from the carrier are determined by the crystal reference while beyond 100 kHz the phase noise is primarily that of the fundamental DRO itself. The key to the phase-lock circuitry is RESOTECH's high sensitivity sampling phase detector which lowers power consumption and reduces component count and unit size. Soft substrates, surface mount technology, and hermetically sealed components are used throughout the assembly to facilitate large volume production and insure highly reliable operation. Another benefit of this design approach is that manufacturing procedures are simplified, allowing RESOTECH to offer excellent delivery schedules. Guaranteed Specifications over -30 to +70 C.
Out of lock alarm is optionally available. Units with internal crystal oscillator are available. Contact the factory for any other special features your application requires. RESOTECH can custom design a unit to meet your special needs. where N is the output frequency ÷ reference, or the multiplication factor. Units are set at the factory for proper operation according to the ordered reference frequency. Significant changes in this parameter, such as a different crystal frequency or different multiplication factor, will require adjustment of the DRO tuning element. While monitoring the phase voltage (ØV), carefully adjust the tuning element housing until a steady state DC Voltage is present (a square wave search voltage indicates the unit is out of lock). Finally, slowly turn the piston/rotor of the tuning element until approximately 5.5-6.0 volts appears at the phase voltage (ØV) terminal.